This space wallpaper shows a deep-field image of what is known as a supercluster of galaxies — a giant group of galaxy clusters which are themselves clustered together. This space wallpaper shows a deep-field image of what is known as a supercluster of galaxies — a giant group of galaxy clusters which are themselves clustered together. This one, known as Abell 901/902, comprises three separate main clusters and a number of filaments of galaxies, typical of such super-structures. 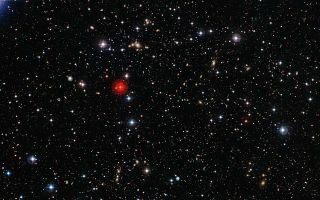 One cluster, Abell 901a, can be seen above and just to the right of the prominent red foreground star near the middle of the image. Another, Abell 901b, is further to the right of Abell 901a, and slightly lower. Finally, the cluster Abell 902 is directly below the red star, towards the bottom of the image. This image was released Jan. 28, 2013.